This is a big year for Chinese tech IPOs. Smartphone maker Xiaomi just completed one of the largest listings ever on Hong Kong’s stock exchange, and other big floats are expected from finance giant Ant Financial, mega-streamer Tencent Music, and “services” seller Meituan. Some of the most highly anticipated listings in China’s tech industry share something in common–they have gained popularity by catering to consumers outside of the country’s educated, cosmopolitan elite. ByteDance, for example, has reportedly been mulling an IPO that could take place this year and bring its market value to about $45 billion (paywall). Touted as one of China’s leading consumer-facing AI companies, one of ByteDance’s most successful apps in China is Toutiao—a news aggregator that curates a feed of stories based on an users’ previous reading (not unlike how Facebook’s News Feed offers up content users are most likely to click on). By now, Toutiao has evolved into a social media platform that rivals Tencent’s WeChat and Weibo. But after it first launched in 2012, it grew popular by offering up lightweight, often sensational news articles. Scrolling through its main news feed yields articles about a street-food vendor nimbly manning 12 grills at once, a video of a cat getting hair cut, and pictures of people who only work out their upper bodies. According to Jenny Lee, a partner at VC firm GGV Capital, Toutiao appeals to internet users in China’s smaller cities looking for news and entertainment outside of stodgy state-controlled media outlets, which dominate print and online publishing in the country. These users’ tastes tend to lean more lowbrow than longread. “Toutiao actually allows you to see the world from where you are,” Lee told Quartz in an interview in April. “It doesn’t appeal to folks in coastal cities where we have an explosion of information. But for a farmer out in the field, or the taxi drivers, they might never leave their town for their entire life. Data from Toutiao shows that almost 90% of its users come from places outside China’s first-tier cities of Beijing, Shanghai, Guangzhou, and Shenzhen. 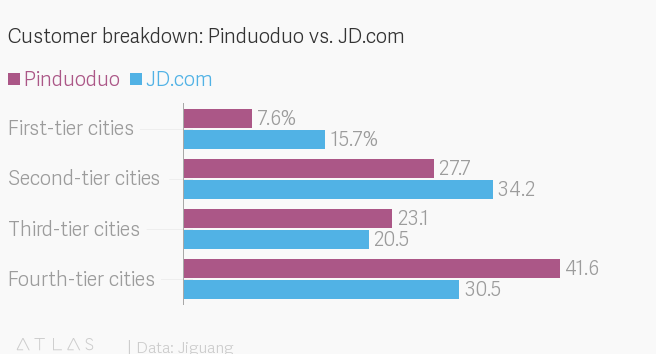 In shopping, Shanghai-based Pinduoduo is set to raise $1.6 billion in an IPO that would value the company at $21 billion—roughly half the market cap size of JD, one of its main rivals. While JD and Alibaba, China’s largest e-commerce company, have steadily offered more and more luxury products on their site, Pinduoduo has moved in the opposite direction. The company soared in popularity by offering group-buying deals on products from no-name Chinese brands. Like Toutiao, it’s been most successful among shoppers outside of China’s major cities. In video, Kuaishou, which competes with some of Toutiao’s video apps, has rose to popularity and distinguished itself from its rivals by providing a glimpse into the lives of China’s countryside dwellers. Currently valued at about $18 billion, the company is reportedly gearing up for an IPO this year in Hong Kong. Many of Kuaishou’s videos feature young men in rural China playing pranks on one another. In one, a boy whacks another with an empty water jug—and that’s all. In another, teenage boys eat instant noodles and stage a fart competition. In another, a boy takes his friend on a motorcycle ride only to leave him abandoned in a puddle of mud. 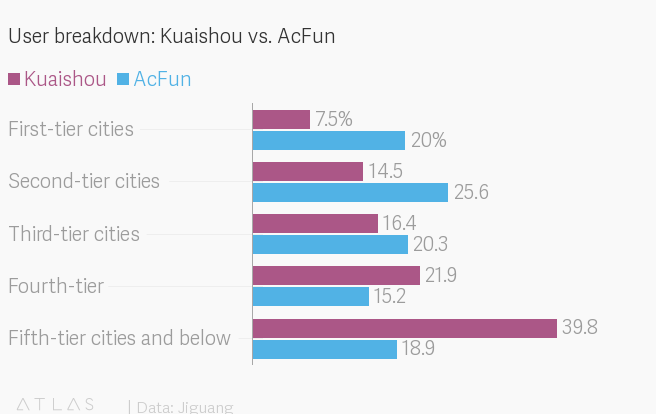 According to Chinese research firm Jiguang, only 7.5% of Kuaishou’s users come from first-tier cities. Yet its growth in China’s poorer cities has helped it expand into richer ones—perhaps tellingly, in June, the company purchased AcFun, a cartoon-centric video site that has been around for more than 10 years and has a bigger presence in China’s wealthiest cities, for a reported $115 million. Kuaishou CEO Su Hua has embraced his app’s popularity among China’s lower classes. “We hope that Kuaishou is a mirror of the world, showing the most complete and accurate look of the world. I don’t want to show things that elites prefer to see in the mirror just because that’s what the elites want to see,” he told China’s Beijing News (link in Chinese). -Ziyi Tang contributed to this piece.